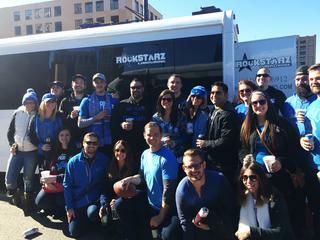 If you are currently looking for a party bus in Birmingham, MI, then your search is now over. Here at Rockstarz Limousine and Party Bus, we specialize in providing you and your guests an amazing experience from start to finish. In other words, you are going to have the time of your life in a party bus that will blow your mind. When you are looking to rent a party bus, you want to be sure that there is more than enough space for everyone involved. That is not a problem with us thanks to the layout of the bus, and there are also a number of leather seats that are perfect for resting your feet as the party continues. Your normal, run of the mill Birmingham party bus rental service does not apply to us. Instead, we seek to take things to a whole new level with you effectively having your own nightclub on wheels. We are talking about a full on stereo sound system that can blast that music out mixed in with a stunning laser light show that will give that atmosphere just that something a little bit extra. Also, when you contact us regarding our Birmingham party bus service, we will find out what the occasion is and make sure that you enjor your time spent with us. Previously, people have used our services for a wide range of occasions from birthdays, to bachelor parties and so much more. It really is up to you. So, if you do indeed reside in the Birmingham area and are looking for a party bus, then give us a call here at Rockstarz Limousine and Party Bus. You can also contact us via our reservation form on our website and a member of our team will be in touch with you as soon as possible in order to discuss your requirements.